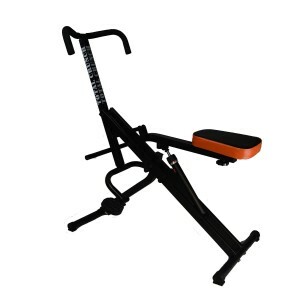 Total Crunch is an all in one “core and ab” workout machine with a sleek and innovative design that imitates horse riding and gives you enough challenge with twelve hydraulic tension levels so you can start out light and increase resistance gradually or vary it during the same workout session for the maximum results. Although the name says “ab slim body core” it is actually designed for a great whole body workout as it will involve different muscle groups simultaneously by using your own body weight to pull and push constantly as part of a compound motion system. So you will be strengthening and toning your shoulders, triceps, chest, pecs, biceps, back, forearms, legs, glutes, hips, thighs, buttocks and obviously abdominals, combining four types of strength training, including squats, back, leg press and abs. Manufacturer of this unique core workout equipment promises six pack in just a month by simply dedicating a quarter of an hour of your time five days a week but this will obviously depend on how big or flat your tummy is and how well you eat- whether you’re on a healthy eating plan. It is lightweight at only 24 pounds and measures 38 x 45 x 18 inches, is built durable- to last a long time with a solid steel frame that can carry users that weigh up to 255 pounds and has a solid hydraulic cylinder. Total Crunch feels like a robust unit to sit on and exercise for a fairly lengthy period of time, which is also helped by the nicely padded comfortable seat and will not take up too much space in your room but with a foldable design you can easily store it in any convenient part of your house. It is suitable for both young and old people, men and women, beginner or advanced for a great ab and all body workout, to burn off calories and fat and to tone and strengthen your entire body. You will make the main muscles of your body contract and tone and get you in great shape with quite a simple motion by which you use your own body to create resistance. What you do is you sit on the comfy seat provided and hold the handles firmly, apply tension to the pedals with your legs, first pull both handles towards you and push it away from you to get back to the first position. By changing the location of your hands on the handlebars you will be contracting slightly different muscles of your body, so do 12 reps for different hand positions on the handles. This seems like quite a fun way to work on your abs and other parts of your body, including hips, thighs, shoulders, chest and arms. As it runs smoothly and fairly quietly you can use it while you’re listening to music or watching a show on TV for a bit of distraction or entertainment so you can work out longer.